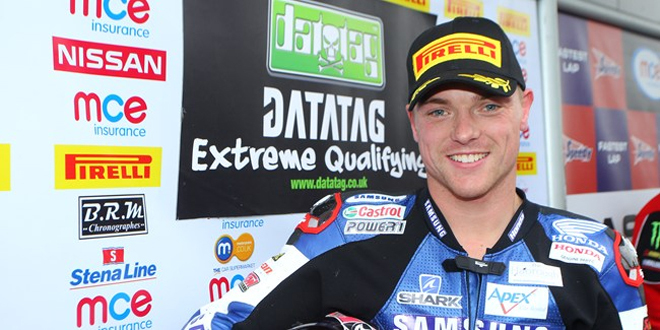 Alex Lowes claimed his second consecutive Assen pole position in the first round of the MCE Insurance British Superbike Championship Showdown at the Dutch circuit as the Samsung Honda rider fired ahead of standings leader Shane 'Shakey' Byrne. Lowes had set the precedent across free practice and as his rivals all upped their pace it wasn't enough to keep him from the top spot, although Byrne pushed him all the way to set his first lap of the weekend 1m:36s barrier. The leading two Title Fighters locked out the first two grid positions but a stunning lap from Tommy Bridewell on his first qualifying performance with Milwaukee Yamaha saw him claim his first front row start of the season, edging out team-mate James Ellison who heads row two of the grid.